The VSS Slurry Transfer Vehicle will convert the Macropaver or most any slurry machine into a continuous machine. Based on the proven technology of Material Transfer Vehicles (MTV) already used in road construction the STV loads the slurry machine with aggregate, emulsion, and water while paving. The STV is designed to work with all major brands of truck-mounted slurry pavers. 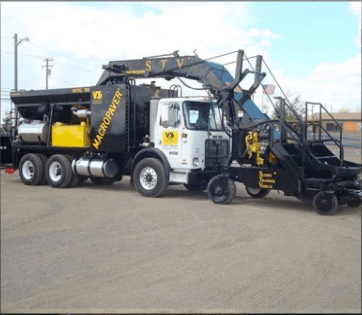 The STV provides a way for truck mounted machines to work on continuous projects while maintaining he ability to work on city streets and in residential areas. It Takes Very Little Training To Learn To Operate The STV. Operators Continue To Use The Familiar Control System On Their Paver Machine To Apply The Slurry Seal Or Micro Surfacing. The STV Controls Will Automatically Start And Stop The Emulsion And Water Transfer Pumps Based On The Tank Levels On The Paver. 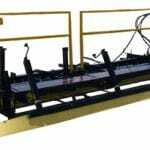 The Pumps And Conveyor Speeds Are Easily Adjusted From A Convenient Hand-Held Display Screen. With only minor modifications for fit-up a slurry machine can be ready for continuous paving for less than half the cost of a continuous machine. The STV can aslo be used at the stockpile for loading machines eliminating the need for a front end loader, emulsion and water tankers. Load the pavers directly from the nurse truck without putting any aggregate on the ground. Place the STV and nurse truck close to the jobsite and dramatically reduce the shuttle time between the jobsite and the stockpile. The equipment division of the Valley Slurry Seal, Co. family, VSS Macropaver, stemmed from the need within the construction industry for a faster, more durable piece of machinery that was capable of withstanding the rigorous day to day operations of road maintenance. The Macropaver was devised as a rugged and reliable large production machine for slurry seal and microsurfacing. Since its creation, today's Macropaver has proven to be one of the fastest, most flexible and cost-effective machines in the road maintenance industry.